#1 – Remember to warm up – this seems like common sense, but it is amazing how often this gets forgotten. I love the arm bike for a good shoulder warm-up, along with some simple rotator cuff exercises, which I plan on discussing in a future blog post. #2 – Back off on chest a bit – in my opinion the chest gets overworked most of the time, often at the expense of other important muscle groups (see tip #3). This can create a muscle imbalance that can contribute to shoulder pain. #3 – Emphasize upper back and rotator cuff strengthening – working on these muscle groups helps protect the shoulder by facilitating proper posture, and positioning of the shoulder. Having good posture and the right positioning helps decrease the likelihood of shoulder injury in the gym. #4 – Be aware of elbow positioning during chest and shoulder exercises – keeping your elbows in front of the shoulder joint during movements like an overhead press or lateral raise can really decrease the likelihood of a shoulder injury. Also, if you are starting to notice some shoulder pain, don’t let the elbows drop below the shoulder during chest press movements (arms parallel to the ground during a bench press – no farther). #5 – Allow for enough rest – As a minimum I recommend that you allow for at least 1 day of rest in between training the same muscle group. If it does hurt or if you are injured more rest days are indicated. 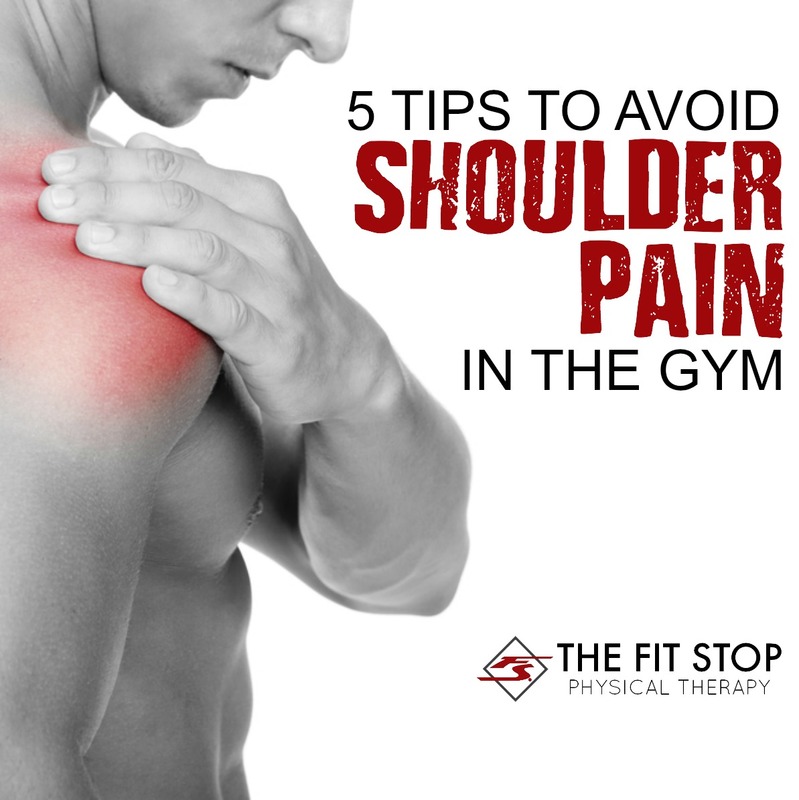 You don’t have to deal with shoulder pain while in the gym. Following these simple tips can decrease the likelihood of injury and get you back to pain-free weightlifting in the gym. If you have any questions please don’t hesitate to stop by our physical therapy clinic, and stay tuned for my favorite shoulder exercises for warm-up and shoulder health! I have experienced different variations for shoulder pain and it has proved to be very annoying when it comes to working out. I’m not sure if it is a temporary thing or if I need to go to physical therapy. Some days are definitely better than others but I am worried that there may be something else going on under the surface. These tips will definitely be put to good use, thanks for sharing! You bet, Jessy! Sorry to hear about your shoulder pain! Speaking from personal experience – these tips certainly have helped me. I don’t do an upper body day in the gym without this exact warm up! Hope it helps you out!